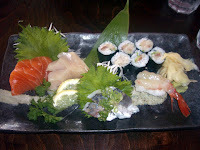 List of Sushi restaurants in Seattle reviewed by Japan native and sushi connoisseur. Located just a few blocks east from Uwajimaya/Kinokuniya, J Sushi, is a fairly new sushi joint that opened 2007 in Chinatown/International District. Compared to the rest of the neighboring sushi places in International District that has been in business for 20+ years, the interior is clean and has modern feel to it. The wall has cool koi and octopuss mural on it. This is also the kind of place where you can easily become a regular as the place is not too big, and you can get to know the friendly head sushi master, Dave Nakamura (third generation Japanese). Dave is young compared to most of the sushi masters, and he likes to chat, so if you are in mood to dine, but don't have anyone to go with, sit at the counter, and Dave will talk to you and make jokes. I give one extra point for Dave's friendly casual personality, but I also have to dock off one point for their stainless steel chopsticks (the metal and raw fish doesn't mix well in my mouth). Sushi is quite good here. It's not the best or highest quality of fish, but they are fresh and tasty. The presentation of the fish is done nicely as well, and on top of that, for this level of fresh sushi, it's a pretty good price. And you can just order 1 piece, unlike most sushi places where you have to get 2 pieces per order. Their rolls are also made well and taste good. Since it's not a high level sushi place, the selection isn't that great but they still carry aji, uni and geoduck on their menu. For lunch I highly recommend their katsu curry rice, which is only $7 and will fill you up. There aren't very many places where you can get such a crisp and yet juicy katsu that matches decent tasting curry like here. Their dinner menu has most of the basic traditional Japanese food, but not as extensive as izakaya food. If you are on a budget or just want to try a bite of lots of different things, the bento set is always a welcoming choice. They only have a few sake selection, but have the decent level ones such as Otokoyama and Hatsumago. Since the place doesn't stand out from the outside and they are not advertised too well, you hardly find this place packed with people. With that said, the service is usually pretty good. If you sit at the counter, the master chef, Dave really tries to make your dining experience a pleasant one. Overall, it's a decent sushi place where you can quickly get to know the chef after just a couple trips, and I hope that they will stay in business for a while.